NASA has released a new enhanced image of Pluto’s North Pole. The huge frozen canyons, as well as other outstanding pieces of terrain, have all been highlighted in bright colors. 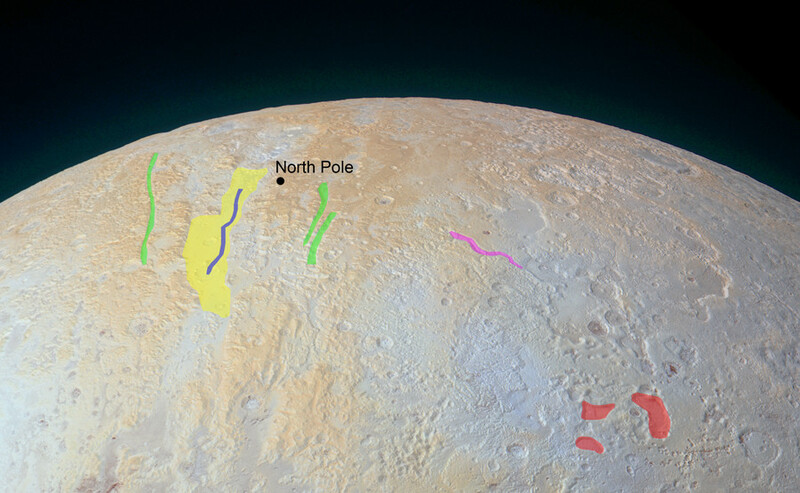 The widest canyon depicted in the photo is right next to Pluto’s North Pole. It is marked in yellow and boasts a span of about 75 kilometers, while those nearest to it, marked in green, are approximately 10 kilometers wide. The erosion visible on the ancient canyon walls may indicate that they are older than other similar canyons or may be composed of weaker material. The canyons also serve as evidence that tectonic activity once took place on Pluto in times long past. The chasms in NASA’s photo run vertically through an area informally called the Lowell Regio, which was named after Percival Lowell, a scientist who initiated the search that eventually led to Pluto’s discovery in 1930 after his death. Thanks to infrared measurements, we know that the Lowell Regio area is rich in methane ice, but contains relatively little nitrogen ice. The parts of the photo marked in blue and pink depict valleys, while areas marked in red are huge pits that appear to be 4 kilometers deep and as much as 70 kilometers across. They may have been formed when subsurface ice melted, causing the ground to collapse. 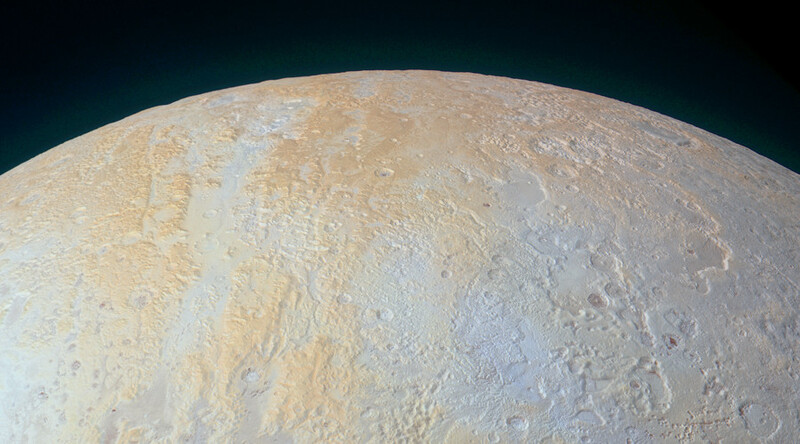 The color in the photo was enhanced to attract attention to the yellowish terrain, not seen elsewhere on Pluto. “One possibility is that the yellow terrains may correspond to older methane deposits that have been more processed by solar radiation than the bluer terrain,” said Will Grundy, New Horizons’ composition team lead from the Lowell Observatory in Flagstaff, Arizona.